This is my very subjective blog entry about our presence at the Ecumenical Church Day 2010 in Munich. It is my personal take on things. Our presence? 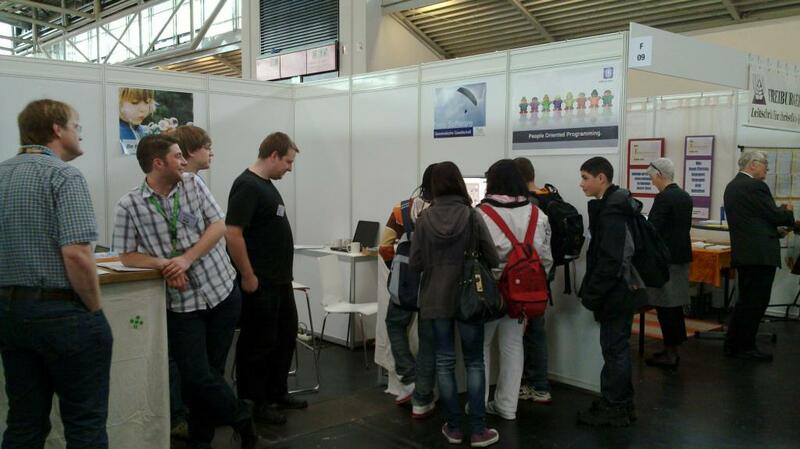 That is FSFE and KDE together in one booth, nicely mixing green and blue. I am back home now and had a night of real sleep. Participating in this event certainly was very interesting. We were five people that care about free software, but only two of us are active in their respective churches. This lead to occasional differences in opinions and made discussions interesting. We did get along very well though, no doubt about that. OK, back to the event. Sometimes the question arises why we are here. Our group, has different personal reasons for our being here. For Thomas it’s the religious part that he cares about, and this includes the institution church. Irina, Eckhart, Daniel and I are here to talk to people on a more personal level and social issues. Of course we have become experts in talking about BibleTime nonetheless. Free software enables easier access to computers, regardless of social background, so we do have a common ground with many of the participating organizations and visitors. It is interesting to hear from teachers about their frustration with traditional school book editorials, problems with copyrighted materials and how they understand that copyleft licenses should be used in education. I do think the number of visitors and interested people is quite good. I have hardly seen the booth void of visitors. So we managed to “spread the word” to many people (incredibly bad pun intended, let’s see if people are able to forgive me for that). Me, never having been at an event comparable to this, enjoyed the new experience. It is delightful to argue about philosophy, ethics and different world views here. Some times the topics are controversial, which is good. Sometimes I felt that some groups are way too extreme in their views (no surprise here). People pushing an embryo into my face and starting a discussion abortion will not convince me of their opinion by citing bible passages and ignoring any social argument. I walked away with nausea after talking to overly radical opinion makers. I do value the variety of opinions that people carry along and exchange. Just being radical and not listening to the arguments of the other party is not useful. Then again, some people do not have real discussion on their todo… Luckily we found a group preaching the opposite opinion for each of the extreme ones. One of our regular booth visitors was Kevin, he keeps dropping by and giving us good tips in how to deal with life as such. My personal highlight was the tea two booths from ours… that’s where I had the nicest discussions. Other initiatives I saw, felt positive and open to me. There are people trying to deal with hiv/aids in sensible ways or pushing for mutual acceptance with other religions. I had several good discussions, sometimes people were surprised: “we don’t see that many atheists around here, it’s nice to talk to you”. My conclusion is that KDE did a good thing in joining up with the FSFE, but sometimes I felt, that Linux distributions that are more geared towards new users would have been nice to have there. Of course we liked talking about free software, had a lot of fun and promoted KDE as great alternative desktop and applications. But we don’t have good answers on where to start sometimes. What makes me happy, is that the free software world has become interesting enough for random people visiting a non-technical event. I think personally that in some ways, going to this event was worth more than to the usual tech events, because we could talk to people that were completely ignorant of us before and we reached a new audience. I am sure we convinced many people to try our software. Now I just wish I would know how many will switch to Linux in the coming days. Edit: Irina really didn’t have institution church on her agenda but talked to people on a personal level. Hey, I did want to (and indeed did) talk to people on a personal level, not from inside the institution! (Anyway, my church is too small in Germany to count as an institution) Agree with you on the whole, though. My blog post is in an almost-finished state, I wanted to write something else first. Sorry Irina, I updated the text to reflect that. No offence taken, I just wanted it clear Thanks! This (up to and including /kde/) is also the thing to syndicate if you want to syndicate me; I’ll put some older KDE-related posts in for completeness’ sake (with dates unchanged) as well as any new KDE stuff. Woot! Palapeli for the win!